Some pretty awesome details in there. They anticipate the program taking two years (2014-2015), and there are four different flight profiles they will be testing. A copy of the table included in the document. Seems the hops will be the most common. Freefall, 5 sec burn at the last moment, soft touchdown. Can anyone model the G-Force curve on that? It sounds like a rough ride. If anyone can guess the terminal velocity of the capsule, it should be easy to calculate. If the G-load is evenly spread over 5 seconds, it might not be too bad. Sounds like they will use the Grasshopper pad unless they decide they will need a dedicated pad, which will be a 40' square pad near the SuperDraco facility. The report describes this as the "DragonRider test area". 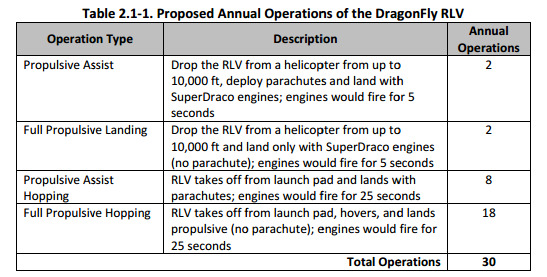 "The DragonFly RLV is the Dragon capsule with an integrated trunk (which may or may not be attached during a DragonFly operation) and up to four steel landing legs. The Dragon capsule primary structure consists of a welded aluminum pressure vessel, primary heat shield support structure, back shell thermal protection system support structure, and a nosecone. This structure supports secondary structures including eight SuperDraco engines (two in each of the four modules [quadrants]), propellant tanks, pressurant tanks, parachute system, and necessary avionics. The propulsion system includes four self‐contained quadrants with independent sets of propellant tanks for system redundancy. The SuperDraco engine uses a fuel‐centered injector to provide appropriate performance for the application. It is also designed to seal off both fuel and oxidizer from the combustion chamber, enabling operation with fast shut‐off and limited propellant “dribble” volumes. The DragonFly RLV weighs approximately 14,000 pounds (lbs) un‐fueled, with a height of 17 ft and a base width of 13 ft. Each pair of SuperDraco engines (eight total engines) are mounted to a monolithic aluminum bracket. This bracket is connected to the pressure vessel with three mounts." "The proposed launch pad would be 40 ft by 40 ft located approximately 0.32 mile north of the Grasshopper launch pad." This might be obvious, but it sure sounds like the DragonFly = Dragon v2 testbed and closely matches the Dragon v2 size. It also seems to echo rumors about the Dragon v2 with the trunk attached, etc. Yes, it is a Dragon 2 test bed.